PV Sindhu wins "Syed Modi Grand Prix Gold Title"
Siliguri's Abul Hossain wins "Kolkata Marathon"
Martyrs' day is being observed today to pays homage to the martyrs who sacrificed and died for the freedom, welfare, and progress of the country. The day marks the 69th death anniversary of the Father of the nation Mahatma Gandhi. President Pranab Mukherjee, vice president Hamid Ansari and Prime minister Narendra Modi gathered at Gandhiji's samadhi at Raj Ghat memorial and paid tributes to the father of the nation. Several leaders and prominent personalities also paid homage to Mahatma Gandhi. On this day in 1948, Mahatma Gandhi was assassinated a little before the sunset when he was on his way to attend his evening prayers. A two minutes Silence was also observed throughout the country at 11 am to pay homage to the martyrs. 30.01.2017 is the Anti Leprosy Day and this day is observed every year in the memory of Mahatma Gandhi who attained martyrdom on this day in 1948, to remember his selfless efforts and care for the people affected with Leprosy. On the occasion, the 'Sparsh' Leprosy awareness campaign is being organised in Gramsabhas across the country. Leprosy is a chronic infectious disease caused by Mycobacterium leprae and it usually affects the skin and peripheral nerves. In a message on the occasion of anti-leprosy day, Prime Minister Narendra Modi has called for collective efforts to eliminate the treatable disease of leprosy from the country. He said, the country needs to work together for socio-economic upliftment of the cured persons. He stressed the need to ensure that these citizens lead a life with dignity as Mahatma Gandhi dreamt of. Mr. Modi said, the effort to eliminate leprosy under the National Leprosy Eradication Programme is a tribute to Mahatma Gandhi’s vision. The Union Home Minister Shri Rajnath Singh will grace the occasion as the Chief Guest. On the occasion, Shri Rajnath Singh will present the Jeevan Raksha Padak awards and Distinguished Service Medals to the NDRF personnel. He will also release the NDRF pictorial book and souvenir to mark the occasion. The NDRF raised on January 19, 2006, is a specialised force capable of responding to any type of disaster in the country and abroad. It is strategically deployed across the nation as per the vulnerability profile of the country. The Ministry of Home Affairs has sanctioned 23 field locations for deployment of NDRF teams as Regional Resource Centres to ensure quick response in the event of a disaster. NDRF provided relief and rescue operations in a number of disasters including floods, train accidents, building collapse incidents, landslides in various parts of the country during the last year. NDRF-National Disaster Response Force: has established itself as multi-skilled, dedicated Force during various rescue and relief operations across the country, more so in extremely challenging situations. Broad experiences of operational challenges and close working with the masses over the years has made NDRF a sharp and efficient response unit. This experience enables NDRF to face challenges with confidence. Over the years NDRF has proved itself a vibrant Force in the country which provides prompt assistance in search and rescue, mass evacuation and immediate relief to victims in case of natural or man-made disasters. So far, NDRF has responded to 1,121 operations and rescued 4,73,594 victims. Shri Amulya Kumar Patnaik, IPS (AGMUT: 1985) has been appointed to the post of Commissioner of Police, Delhi from the date of actual assumption of the charge, in place of Shri Alok Kumar, IPS (AGMUT: 1979) who has been appointed as Director, CBI, till further orders. Swiss star Roger Federer has annexed his 18th Grand Slam trophy. In the summit clash of the Men's Singles at the Australian Open in Melbourne on Sunday, he defeated arch-rival Rafael Nadal of Spain in five sets 6-4, 3-6, 6-1, 3-6, 6-3. It was Federer's first Major title win after the 2012 Wimbledon. 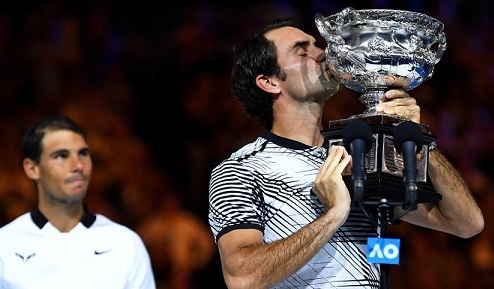 In the process, 35-year old Federer also became the second-oldest winner of a Grand Slam tournament in the Open Era after Australian Ken Rosewall won the Australian title at the age of 37 in 1972. Earlier in the Mixed Doubles final, India's Sania Mirza and her Croatian partner Ivan Dodig ended as runners-up, after losing to the Amerian-Colombian duo of Abigail Spears and Juan Sebastian Cabal in straight sets 2-6, 4-6. It is second runners-up finish for Sania and Dodig together, after losing the final of the 2016 French Open to Leander Paes and Martina Hingis. Olympic silver medallist PV Sindhu has won her maiden women's singles crown at the Syed Modi Grand Prix Gold badminton tournament. In Lucknow yesterday, top seed Sindhu outplayed Indonesia's Gregoria Mariska in the summit clash in straight games 21-13, 21-14. In the Men's Singles, National Champion Sameer Verma bagged the title defeating compatriot B Sai Praneeth 21-19, 21-16. India also claimed the Mixed Doubles title, when Pranaav Jerry Chopra and N Sikki Reddy emerged winners by beating compatriots Ashwini Ponnappa and B Sumeeth Reddy 22-20 21-10 in the final. Overall, India scooped up three titles out of the five events in the tournament. In the Women's Doubles final, the Denmark duo of Kamilla Ryter Juhl and Christina Pedersen beat the Indian combination of Ashwini Ponnappa and Sikki Reddy 21-16, 21-18. The Men's Doubles title was also claimed by Denmark, when Mathias Boe and Carsten Mogensen emerged winners against the Chinese Taipeh pair of Lu Ching Yao and Yang Po Han in straight games 21-14, 21-15. IndiaPost under Department of Posts (Union Ministry of Communications and Information Technology) received final payments bank licence from the Reserve Bank of India (RBI). With this, India Post became the third entity after Bharti Airtel and Paytm to receive final payments bank licence to roll-out of banking operations commercially under the permit. Siliguri lad Abul Hossain won the Kolkata Marathon on Sunday with a timing of two hours, 34 minutes and two seconds. Kolkata lad Biswanath Pal was second, as he finished five minutes behind. Paritosh Roy came third with a timing of two hours, 52 minutes 48 seconds. Sikkim's Mangali Tamang won the women's half marathon with a timing of one hour 31 minutes and 13 seconds. Meghalaya's Kyntimon Marwein finished second with a timing of One hour, 33 minutes, 04 seconds. Her younger sister Dateibankynmaw ended third clocking 1 hour, 35 minutes and 48 seconds. Overall, amateur runners from north Bengal and Northeast India dominated the first edition of the meet. ongratulating the participants, Indian cricket icon Sachin Tendulkar, who flagged off the races, said that it has been a successful event.